I have long been in love with pizza, and Aniello’s Pizza may be the one to thank (or to blame). I grew up just outside of Corning, N.Y. — in a small town called Painted Post. For those of you that don’t know where either of those places are, they lie about two hours from Syracuse, N.Y., and well within an afternoon joy ride. I guarantee if you go, the pizza will bring a smile to your face. 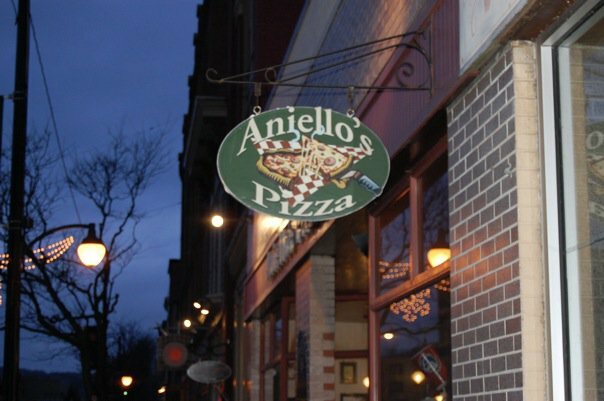 Aniello’s is situated in the middle of town, on Market Street. You can walk up and down finding cafes, hair salons, small boutiques, consignment shops, and more, but if you visit you cannot avoid the last block which hosts my favorite pizza parlor. I may be slightly biased, but this is easily some of the best pizza in upstate New York. A few weeks ago my roommate and I took a day trip to my tiny hometown and she was equally as satisfied when a large half chicken wing, half cheese pizza arrived at our table with an accompanying dish of bleu cheese. This pizza is New York-style, with a thin crust that’s flexible enough you can fold it in half to enjoy it as a double-decker. The sauce’s hint of oregano combined with delicious, melted mozzarella make for the perfect, greasy, delicious bite. If you like spicy, absolutely try the buffalo chicken pizza. It packs more than a mildly spicy punch, but combined with the cool from the bleu cheese dressing, it doesn’t leave you breathing fire. If you enjoy buffalo chicken but don’t want to try trailblazing– stick to the buffalo chicken subs, or any subs for that matter. 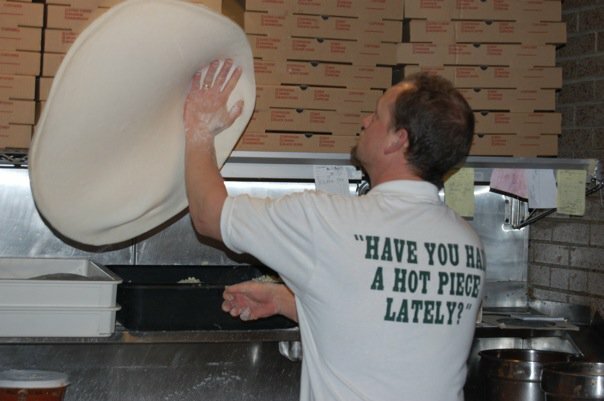 The friendly local staff wearing “Have you had a hot piece lately?” T-shirts may convince you not to leave without trying the pizza, but if you’re not in the mood, the fresh sub rolls and ingredients make for an equally pleasing indulgence. A couple recommendations: call ahead and order because they get very busy, and that way you don’t have to make your stomach suffer while you watch them twirl the dough! Secondly, order a full pie, try to avoid slices. Unless it’s lunch hour, you may miss out on trying their freshest pizza. Plus, don’t make the trip without guaranteeing yourself leftovers! Trust me on this one. Oh, and lastly– BRING ME SOME. Next Save Me a Slice!